The Epson Stylus Photo RX500 is a mid-range inkjet printer all in one, that aims at the small to mid-sized offices with moderate print and scan requirements and heavy photo print requirements. Epson has tried to give some special accessories for it to serve its photo printing functions better. The printer her comes with a maximum resolution of 5760 x 1440 dpi for both monochrome and colour prints. The printing speed in monochrome is 17 ppm but the print speed for colour printouts is 0.5 ppm which is shockingly slow for a printer of this price range. There are 6 Epson Stylus Photo RX500 Ink Cartridges with the usual CMYK inks and the extra light cyan and light magenta, for better photo reproduction. While the photo prints come out really good, the text and graphic prints are not of similar quality. The scanner in this unit has a maximum resolution of 2400 x 4800 dpi, with a copying speed of 10 ppm for black and 8 ppm for colour printouts. The scanning results are of a good quality. This all in one comes with a USB connection and a support for most kinds of flash memory cards and more. Due to the focus on photo printing, it even has a holder to hold the 35 mm film and negatives when they are being scanned. The input tray has 150 sheet capacity. The software that come with the printer is very useful, especially the image fixing software that takes faded prints and negatives and restores colour into the faded photographs. The Epson Stylus Photo RX500 Ink Cartridges can be replaced separately saving costs and ink. Given the functions and build quality, it is a compact unit which can be setup on a computer desk rather than be needing a standalone desk of its own. Epson Stylus Photo RX500 is an all in one that focusses on photo printing, it serves it purpose well, but disappoints on the other functions like text and graphic printing. Overall it is a good value for money unit, best for people with a heavy duty printing and scanning requirements with special focus on photo printing. How to remove and reinstall the new cartridges in the Epson printer? Before you begin the installation process, make sure you have the new Epson Stylus Photo RX500 ink cartridges handy. Once you start the ink cartridge replacement procedure, you must complete all the steps in one session. To install the new cartridges, follow the steps as described below. Step 1: Make sure that the Stylus Photo RX500 is turned on and is not printing. Step 2: If an ink cartridge is empty, check the LCD screen to identify which cartridge is empty. After this, press the colour button. Now, if an ink cartridge is low in ink then press the setup button to enter the setup mode. Press the top left button next to the LCD screen until replace ink is displayed. Finally, press the colour button. Step 3: Open the scanner on the LCD screen, when the message is displayed. Use the side grips to open the scanner unit. Be sure to keep the scanner lid closed. Step 4: Wait for the Epson Stylus Photo RX500 ink cartridge holder to move to the replacement position. After that, open its cover by pulling the back of the cover-up and towards you. Caution: Never attempt to open the cartridge holder cover while the print head is moving. Wait until the cartridges have completely moved to the replacement position. Step 5: Identify the Epson Stylus Photo RX500 ink cartridge that you need to replace. Press in the tab at the back of the cartridge to release it, then lift the cartridge straight out. Its disposal should be done carefully. Step 6: Finally, unwrap the new cartridge. Step 7: Lower the new cartridge into its holder, then press down on the top of the cartridge until it clicks in place. Note: If you need to replace other ink cartridges, repeat the steps 5 to 7 before continuing with step 8. Step 8: Close the cartridge cover. Step 9: Carefully lower the scanner unit and press it down until it clicks into place. The printer begins charging the ink delivery system, and it appears on the LCD screen. Wait for the message to disappear before using the printer. Caution: Never turn off the printer while charging appears on the LCD screen unless it hasn't moved or made noise for more than 5 minutes. This may cause incomplete charging of the ink. Q. I’ve been using Epson Stylus Photo RX500 printer for my small office. Suddenly, “printer out of ink” error message is encountered. What does this message indicate? How can I resolve this issue? A. This error message is detected when any of the black or colour Epson Stylus Photo RX500 ink cartridges are low or have gone empty. To know which installed cartridge is running out of ink, click on the message and check. To resolve the issue, replace the ink cartridges. You can look forward to compatible Epson Stylus Photo RX500 ink cartridges for replacement. These ink cartridges produce as impressive results as the original ones. The compatible ink cartridges save upto 50% of your cost. Also, the compatible ink cartridges of Printerinkcartridges.ie are factory tested and guaranteed. Q. Can I use this printer for my photo printing task? A. Yes, definitely. 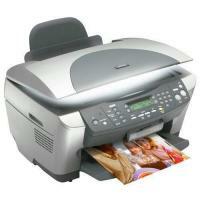 The printer aims at producing high quality photo prints. The printer offers extra light cyan and light magenta inks, for better photo production. Q. Can I replace Epson Stylus Photo RX500 ink cartridges separately? A. Yes. There are 6 Epson Stylus Photo RX500 ink cartridges with the usual CMYK inks and the extra light cyan & light magenta inks. You can easily replace the ink cartridge that is empty or needs replacement. With this feature, you can save your printing cost by replacing one ink cartridge, instead of whole ink cartridge. Q. What are the weight and dimensions of Epson Stylus Photo RX500 printer? A. The printer weighs 22.05 lbs and measures 18x17.7x10.1 inches (Width✕Depth✕Height). Q. Is the print speed same for monochrome and colour printouts? A. No, the print speed is not same for monochrome and coloured prints. The printing speed for monochrome prints is 17 pages per minute & the printing speed for coloured prints is 0,5 pages per minute. Q. When I try to do colour printing my Epson Stylus Photo RX500 prints out only in black? Why is this happening? Does it mean the coloured Epson Stylus Photo RX500 ink cartridges have run out? A. If your machine is printing just in black then it means the settings in the printer driver may have been put to use black ink only. For a Windows OS, please click on Customising Windows Print Settings and ensure the ‘black ink only’ option is not selected. For Macintosh OS, go to Customising Print Settings and ensure that the ‘colour’ option is not set as ‘black’. The problem has nothing to do with the ink cartridges. The LCD screen displays ‘ink low’ message with the error light flashing if one of the ink cartridges have low ink. Hope this clarifies your question. A. Unfortunately, the printer does not support a wireless connection to a network router or Ethernet and is devoid of built-in wireless features. However, you can connect the printer to a direct wired connection to the computer. Q. I kept my printer idle for more than four months with the Epson Stylus Photo RX500 ink cartridges installed. Can I use the cartridges now or do I need to replace them immediately? A. It is not necessary to replace the cartridges until they function properly. Cartridges can stay inside the printer for a period of six months when not in use. Try printing some sheets and if you find the quality of printouts is not up to the mark, then try aligning and cleaning the print head. If this doesn’t work print a nozzle check to verify which Epson Stylus Photo RX500 ink cartridge is not functioning. After verifying it you can replace the cartridge that is not working. Q. How do I replace Epson Stylus Photo RX500 cartridges with the compatible ink cartridges? If I use compatible cartridges will I void the warranty of the printer?? Confirm which ink cartridge is empty by referring to the LCD panel message. To enter the Setup Mode press the Setup Mode button and continue pressing the button until you get option4 Ink cartridges on the LCD panel.Select colour button. The cartridges will move into the replacement position. Open the scanner unit after ensuring that the document cover is closed. Open the cartridge cover and remove the cartridge from its packing. Lift the cartridge your want to replace by pinching the sides of the cartridge. Install the new cartridge straight into the placeholder and then press the top of the cartridge until it clicks into the place. Close the cartridge cover followed by the scanner unit. Using compatible cartridges will not void the warranty of your printer until the damage or failure is attributable to it. Q. How do I check the ink status of my printer Epson Stylus Photo RX500 in my mac? Open Print or Print setup Dialog box. Click on the Utility Icon button followed by Epson Status monitor in the dialog box. You will see the graphical representation of the ink. Double click on Macintosh HD followed by double clicking on Applications folder. Double click on EPSON printer Utility icon.The printer list window appears. Click on OK button after selecting the product.The EPSON printer utility dialog box appears. Click the EPSON Status Monitor button.The EPSON Status Monitor Dialog box appears. You can check the updated ink level by clicking on update button under the graphical representation of the ink. Q. I want to buy 30 Pack of Premium Compatible EPSON T0487 Ink Cartridge Multipack for my printer Epson Stylus Photo RX500.I require them urgently. Do you deliver next day? A. Your Stylus Photo RX500 ink cartridges will be delivered to you next day if you order before 1 pm in between Monday-Friday.We try our best to dispatch the order as soon as we get the order but there might be a delay from Fastways courier’s network distribution in case you live in a remote locality If you require it urgently then contact us via email, phone or live chat to check if the product you ordered is in stock. Q. What is the guarantee of the Compatible EPSON T0487 Ink Cartridge Multipack? A.The mentioned Stylus Photo RX500 ink cartridges multipack has the warranty of the 12 months following the date of purchase. We offer replacement or refund in case if the product is deemed to be faulty. Q. I have not received the order for my Epson Stylus Photo RX500 printer since last seven days. How will I get my refund? A. If your Stylus Photo RX500 ink cartridges are not dispatched we will cancel your order and refund the payment according to the policy by placing a credit on your account. If the order has been dispatched and you do not want the cartridges now then you can refuse to sign for on delivery. Q. My printer Epson Stylus Photo RX500 is accidentally soiled with the ink what should I do? A. You need to wipe the ink gently with a damp cloth without touching the internal gears.Please make sure that the ink does not come in contact with your hands or eyes.If the Stylus Photo RX500 ink cartridges are damaged do not try printing documents from those and order new cartridges for replacement.